Amitabh Bachchan upcoming movie teases fans with 'Shamitabh' storyline | GSV Films :: Film news, video songs, movies news telugu, tamil hot actress. MUMBAI: The posters and trailer of Amitabh Bachchan starrer upcoming film 'Shamitabh' have aroused the curiosity of fans and the megastar has now revealed new details about the plot. The 72-year-old actor said that he and the makers of the film, producer Vidhu Vinod Chopra and director R Balki, are guarded about the sharing story details as it will take away the element of surprise. "They ask me why this title 'Shamitabh', and I have no words to express other than if I do I shall have to reveal the story and that is a problem for if the story goes out then the film is known and the element of surprise has left us and gone," Bachchan posted on his blog. However, he did give a sneak-peek into the film, which also stars Dhanush and Akshara Haasan. "Two individuals that possess different talents. The one with one does not have the other of the other. And the other of the other does not have the one of the one. But when brought together they can achieve what individually they could not .. and when they do due to the efforts of a third, they measure up to the best and the highest. 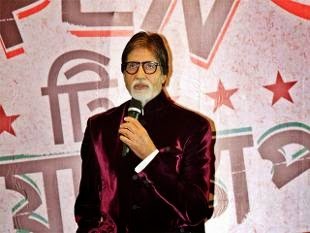 "The problem shall come when the clash of the ego takes place.. one realising that the other is the other because of him, and the other realising that the one is the one because of him," Bachchan said. 'Shamitabh' will hit theatres on February 6.